You'll never see anything like it again: 6-4, 3-6, 6-7 (7), 7-6 (3), 70-68. 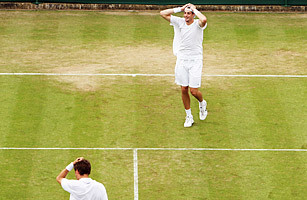 At Wimbledon this June, American John Isner, and Nicholas Mahut of France, played a fifth set headed for infinity, thanks to Wimbledon's shunning of fifth-set tiebreakers, and the inability of either player to break the other's serve. In all, their historic first-round match lasted a record 11 hours, and five minutes, played over the course of three days. On two different occasions, the match was suspended because of darkness. It was the longest match in tennis history by nearly five hours, and both players shattered the prior record for most aces in a match, 78  with Isner gunning 112, and Mahut a mere 103. During the 138th  typing that number still seems ridiculous  game of the fifth set, Isner stroked a backhand winner down the line to finally break Mahut's serve, and end it. The 6'9" Isner fell to the ground, and kicked his legs in the air: afterwards, both players looked understandably exhausted. "We played the greatest match ever, in the greatest place to play tennis," said Mahut. "I thought he would make a mistake. I waited for that moment, and it never came."